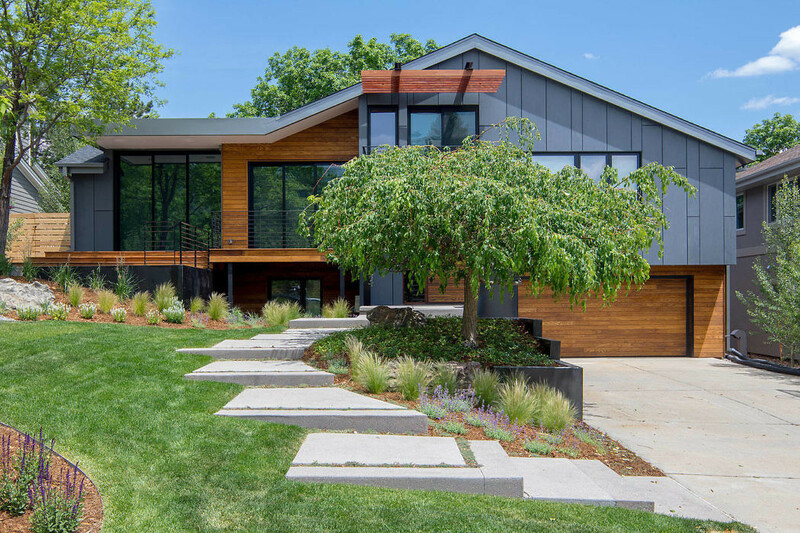 Redesigned in 2017 by bldg.collective, this modern single family is situated in Boulder, Colorado. The young family that bought this house had just moved back from 2 years of living in Costa Rica and wanted a home with clean lines, open spaces, and a warm modern aesthetic. The original 1979 cedar and brick sided home was in desperate need of an update. We rearranged the interior spaces to open the house to the mountain views to the south and improved the energy efficiency with new exterior insulation and high performance windows. The exterior cement board panels were selected to give the home a clean and modern look and minimize long term maintenance. Our team was also responsible for the interior design of the home. The custom built-in cabinets throughout the house create a coordinated and unifying look and feel from room to room. The wide plank european oak floors give the home a soft feel under the feet while the hot rolled steel accents give the material palate depth and an unpretentious edge.